Cat® hydraulic shovels offer superior productivity with fast cycle times, high bucket fill and the ability to withstand the rigors of any digging environment. To provide increased uptime and low operating costs, components are easily accessible and unique features ease troubleshooting. A clean-sheet, single-engine design driven by customer input, the all-new Cat® 6020B provides the simplicity and versatility expected in the 160 tonne (176 ton) class. It includes a safety enhancing operator's cab, superior serviceability with a unique walk-through power module, industry-leading efficiency with dedicated pump flow allocation technology, and reduced field assembly time via the modular design. 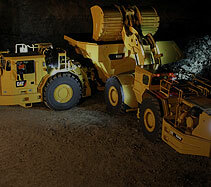 The 6040 can cover a wide range of trucks, from 109 to 218 tonnes (120 to 240 tons).